Two weeks ago on Site of the Week, we showed you what the Empire State Building looked like in January 2001, back when it was just one of three tall tower sites in the nation's largest market. Just a few months later, of course, the history of New York broadcasting was changed irrevocably with the destruction of the World Trade Center. The immediate response of New York broadcasters is chronicled elsewhere on this site, at our 9/11 Plus One page. 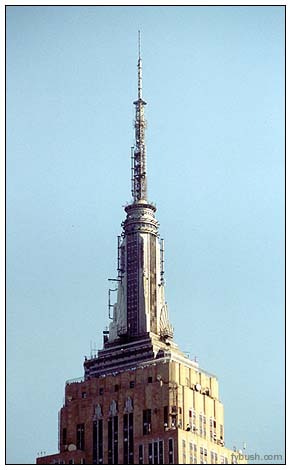 By the time we first visited Empire in early 2001, broadcasters occupied the 81st, 83rd and 85th floors - fifteen FM stations, all but three of them sharing the ERI master antenna; three analog UHF stations (channels 25, 41 and 68); two DTVs (CBS' WCBS-DT 56 and Fox's WNYW-DT 44) and one auxiliary VHF TV (WCBS-TV 2). 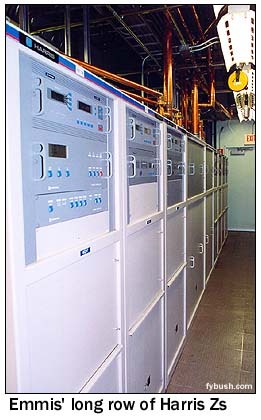 Much of the space on the transmitter floors and on the mast itself that had once been occupied by the big VHF TV stations had long since been reclaimed by radio - channel 68's antenna replaced the old WNBC-TV 4 antenna at the tip of the mast, ABC's WPLJ 95.5 used the mast space once used by sister WABC-TV 7, and the 85th floor that was once NBC's sole domain had been parceled out among several broadcasters. In these views from July 2002 and January 2003, we see what replaced NBC. 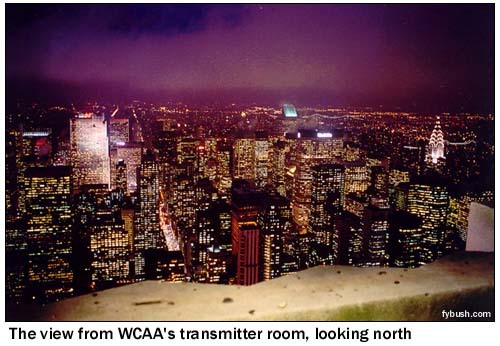 On the west side of the 85th floor, where NBC's channel 4 transmitter once sat, Univision's WXTV (Channel 41) now had its transmitter room. with that big Harris transmitter seen above at left. Its new Telefutura sister station, WFUT (Channel 68), occupied a space on the east side of the floor. 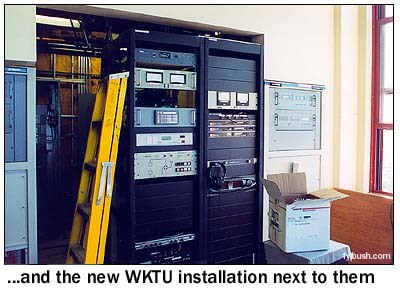 But change was already in the air: a space on the 80th floor once occupied by Alan Dershowitz's law office had been cleared by early 2003, and WXTV and WFUT were preparing to move downstairs to clear space for an eventual TV combiner that will feed a new master TV antenna. And while you admire the view from WCAA's transmitter room, including the Chrysler Building on the right and the GE Building on the left, we'll mention the one room on 85 that we haven't seen - the WPLJ transmitter room, now occupied by both WPLJ and WABC-TV 7 in what we hear is a rather uncomfortable tight squeeze. Across the floor, on the south side of 85, Emmis Communications recently finished moving all three of its FMs into a single space once occupied by NBC's FM on 97.1, variously known as WEAF-FM, WRCA-FM, WNBC-FM, WNWS and WYNY before becoming today's WQHT. 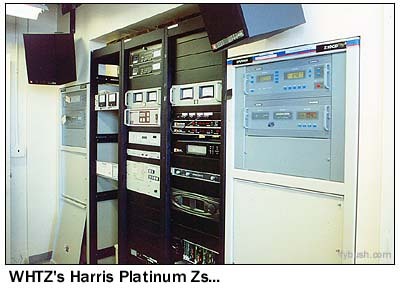 Now its two Harris Platinum Z transmitters share a row with four more identical units, two each for WRKS (98.7) and WQCD (101.9). And check out that control panel above at right - plenty of switching capability to handle multiple STLs (microwave and T1), main and auxiliary transmitters and so on. Emmis also has a rarity at Empire - a generator to provide backup power to the transmitters should the power go out (and we know it can!) Diesel fuel for the generator has to be brought up the elevator in five-gallon cans, believe it or not. There's one more important room on the 85th floor that we can show you: the famous room 8515, home to the combiner that feeds the ERI master antenna high above. 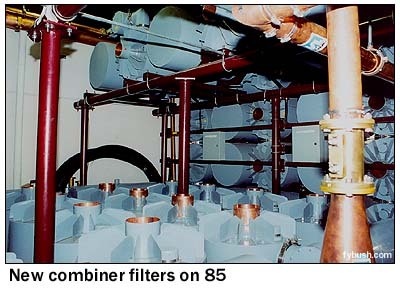 After 9/11, the combiner had to be expanded from the 12 FM signals it already handled. 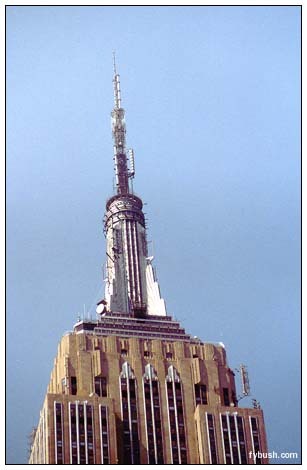 While WKTU (103.5 Lake Success) was able to continue operating at more or less full power from Four Times Square, WPAT-FM (93.1 Paterson) and WNYC-FM (93.9 New York) had no backup capability and had to scramble to get on the air at Empire. 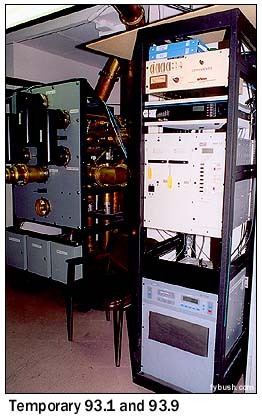 The rack at right, with a low-power BE transmitter for WPAT-FM and a low-power Harris for WNYC-FM, was an initial solution to the problem, allowing the two stations to get back on the air through the old Alford master FM antenna. 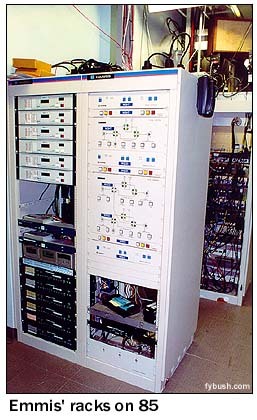 Later, both stations went to Four Times Square with higher power - and still later, they (along with WKTU) were added to the ERI master antenna system, which required a whole new rack of tank filters to be added to the combiner system, bringing the total number of stations on the ERI master to 15 - WXRK 92.3, WQXR-FM 96.3, WSKQ 97.9, WRKS 98.7, WBAI 99.5, WHTZ 100.3, WQCD 101.9, WNEW 102.7, WKTU 103.5, WAXQ 104.3, WWPR 105.1, WCAA 105.9, WLTW 106.7 and WBLS 107.5. Let's head down to the 81st floor for a peek at the renovated WHTZ room on the southeast corner, shall we? 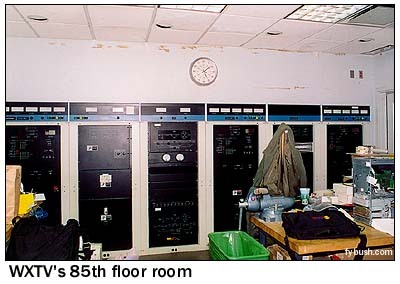 Clear Channel had just finished rebuilding this room in the fall of 2001 - as in, the drywall had just been finished on the new wall next to Z100's Harris Platinum Z transmitter. 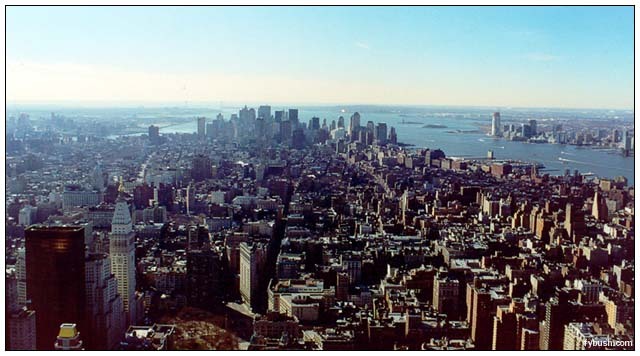 With the demise of WKTU's World Trade Center facility, plans were immediately drawn up to build a new permanent WKTU facility in the WHTZ room, and now there are four Platinum Zs there, not to mention a million-dollar view over the Hudson to Jersey City and the WKTU and WHTZ studios. NBC's Telemundo outlet on channel 47, WNJU, and Pax's channel 31, WPXN, are also recent additions to the Empire mast, and I'm not sure where their antennas are now - or where they'll end up when all the work is done. 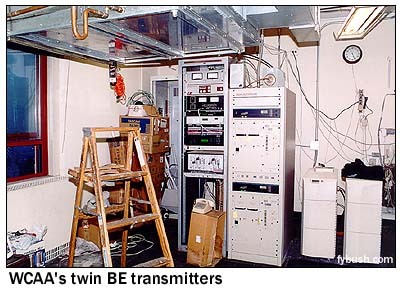 The WQHT/WPLJ antenna is below the ERI master, sharing an aperture with WNYE-TV (Channel 25); below that is the WCBS-TV/DT antenna that kept channel 2 on the air when all the Trade Center broadcasters went dark. Those T-shaped bars around the 102nd floor observation deck are the old Alford FM master antenna, and it's likely that it will eventually be replaced by a newer FM antenna. 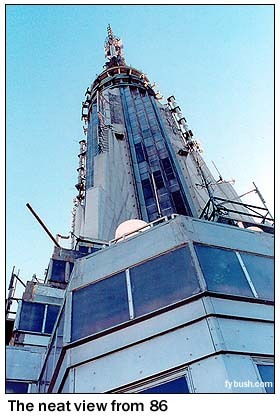 And those UHF antennas mounted on the side of the mast below 102 belong to WNYW-DT (Channel 44), with WNYW-TV (Channel 5) and its sister station WWOR-TV (Channel 9) down below the 86th floor deck with temporary antennas. (You can see them in the photos at the top of the page, taken from the WOR studio roof at 1440 Broadway and from Bryant Park.) We'd expect all those signals to eventually migrate up the mast in the years to come. There's a lot more change yet to come at Empire, it's clear - and we'll no doubt be revisiting this historic site in the months to come. Thanks to Emmis' Jim McGivern, WCAA's Richard Ross and WHTZ's Josh Haddon! Next Week: West Michigan - WKZO, WOOD and more!